Social sharing is fast becoming the predominant way that content is discovered. We click links that our friends share on Facebook. Publications and brands publish millions of content pieces everyday but lack tools to increase engagement. Naytev allows publishers to create multiple image and tagline combinations, test which one drives the most traffic, and automatically update all future shares to the combination that gets the most clicks. More shares = more views = more revenue for publishers. 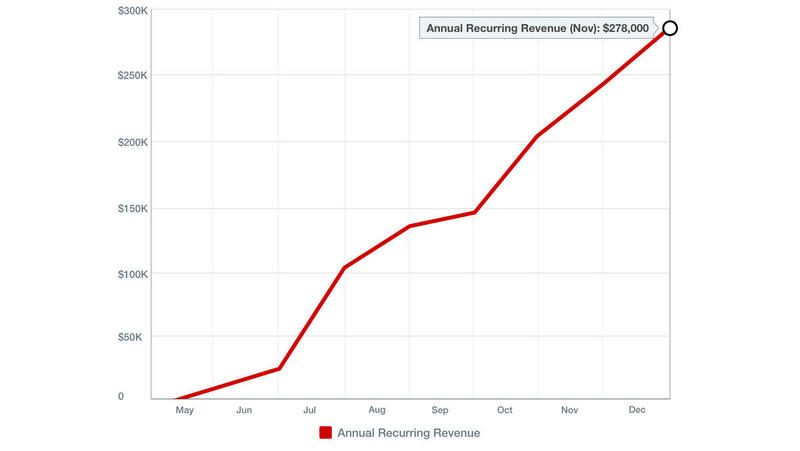 1 $278k annual recurring revenue. 2 30% month over month growth since May. 3 On track for profitability Q1 2016, with $85k monthly revenue. 4 Clients: News Corp, MTV, Conde Nast. 5 50% avg. post engagement improvement with Naytev. 6 Average revenue per user is $500 per month. $100 CAC. $2,500 LTV. 7 Negative revenue churn, and almost no churn for users once they start running tests. 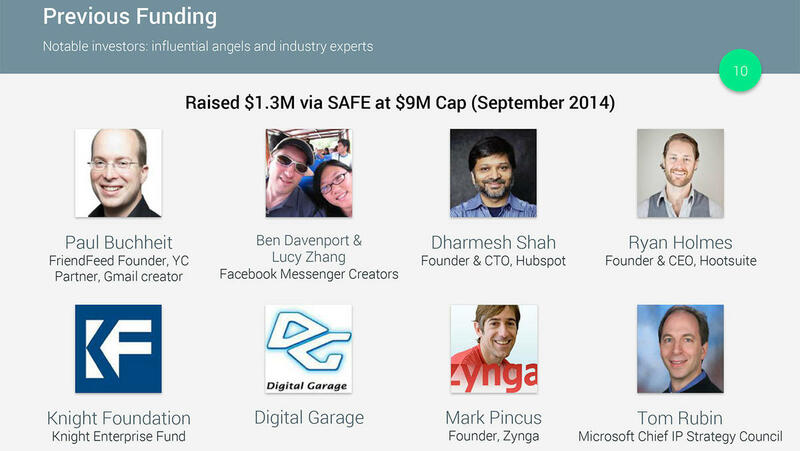 8 Select investors include: Paul Buchheit, Y Combinator, Ryan Holmes. Zack founded non-profit fundraising platform Changecause. Formerly at Google and LivingSocial, Zack was also a Captain Sailor on Sail Caribbean. Patrick founded video streaming platform Sapunda, He is a founder of Lean Startup Machine D.C and is a Y Combinator alum. Edward was a marketing analyst at LivingSocial. He is an alum of Y Combinator and University of Virginia. Michael was a web developer for NPR and developer of reminder app iNag. He has a B.S in Computer Science from University of Rochester. History has shown that helping content publishers get more views cheaper is a great business model. Billion dollar businesses have been built on Ad optimization and Search Engine Optimization. Social will soon be the primary customer acquisition channel for brands and publishers, and right now Naytev is the only product that can improve content virality by making it more shareable. They have product market fit with 0% of customer churn for those who have run more than a few tests. Conde Nast and News Corp are already happy customers, and they have grown revenue 30% month over month since May. Buzzfeed built a $1.5 Billion business by proving that packaging content for social media can be more important than the content itself. The easiest way to improve readership and number of shares is with quality top level messaging – headlines and thumbnails. Naytev makes the Buzzfeed testing model available to anyone with easy to use software. All that Naytev customers have to do is enter in a few content variations, and the software goes to work A/B testing which combination of headline and banner image is most engaging. Then Naytev automatically serves the viral combination in real-time. Some fundamental market changes will make social sharing even more important. 31% of all web traffic begins with social media, and Twitter and Facebook are moving towards a model where content shared on their platforms will be consumed there as well. Readers will no longer have to click through to the publisher's website. In that world, sharing becomes even more important, and having a firm grasp of your social media analytics will be as important as SEO. Most importantly, we believe in the team. They have been extremely thoughtful and disciplined with how they have built the business, and we learn a ton about the future of content on the web every time we speak to them. Just read the interview. They were great friends for years before founding Naytev, and have relevant experience selling advertising at Google, building out NPR’s entire web presence, and constructing predicting algorithms for the solar industry. Everything is done in house and they move fast - they built a working prototype for their first client in 2.5 weeks and Naytev is on track for profitability within 4 months. Now they just need a little capital to bolster their sales team and grow faster in advance of their next round. This is awesome! Much more intuitive than Facebook’s Power Editor, and really easy for anyone to run great Dark Tests. Great tool, highly recommend it. A piece of content may be incredible, but the packaging can make a story sink or sing with our social audience. Only 10% of content drives 90% of engagement. That's a huge opportunity if you can figure out which content is worth investing in before it's too late. Naytev's algorithms look at a range of engagement signals to understand which content is worth promoting. 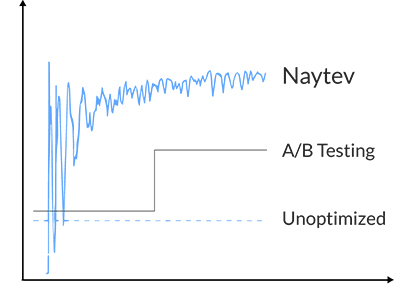 Naytev's machine learning approach to optimization is faster than A/B testing. They test multiple versions of the images and text that appear on social media and automatically prioritize the highest performers in real-time. Naytev elevates the social presence of the entire brand and builds on that success. By using Naytev, content writers learn what type of content works well. They also help customers improve their engagement score in Facebook’s algorithm so subsequent posts perform better. 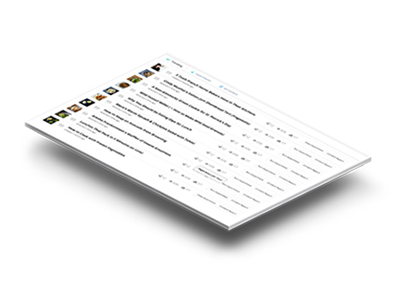 Naytev launched to publishers in late 2014. 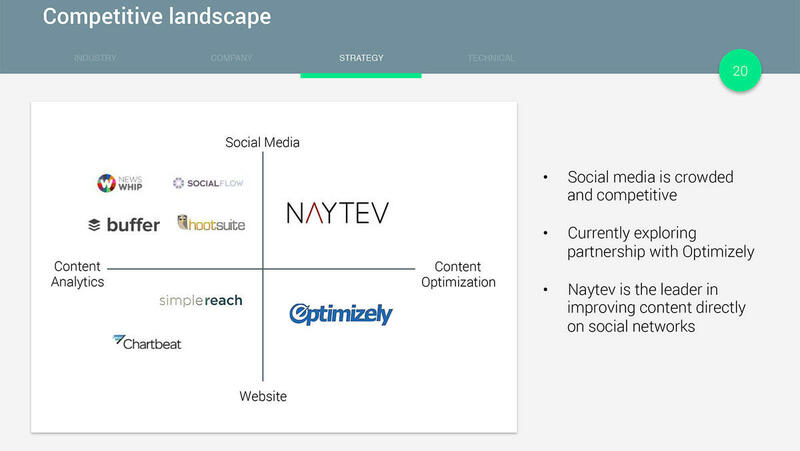 Shortly after this launch brands approached Naytev to optimize their own content. 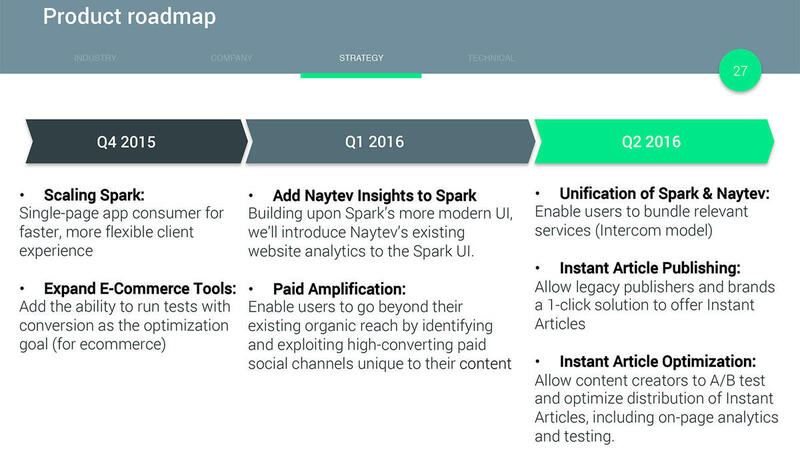 Some of the biggest publishers and brands already use Naytev and Spark everyday. Since starting to charge in May 2015 Naytev has grown 30% month / month. They're on track to profitability in Q1 2016. We know two things: nobody clicks on ads anymore and social media will soon be the #1 way we discover things online. Facebook already accounts for 25% of all Internet traffic. Companies need a way to ensure their content is shared by readers. That gets them more clicks, more views, and more revenue - on average Naytev improves engagement 50% of the time. Naytev may soon sit right in between every brand and publisher and their most important acquisition channel. Why is now the right time for Naytev? Websites have never been able to optimize how their content is shared socially. In recent years social referral traffic has jumped to account for 60–70% of traffic for large publishers, a number that is still growing. New content sites like BuzzFeed, Business Insider, or anything you frequently see in your Facebook feed get up to 75% of their traffic from social media.We have proven an ability to boost that referral traffic by around 33% on average. We are building the largest set of data to understand what kind of messaging induces users to engage with specific kinds of content on social media, and we will be able to use that knowledge to continuously improve our clients ability to spread their message. We are doing for social what SEO did for search 10 years ago. Why are you the team to pull this off? We came to Naytev as a full pivot from a previous business and have proven an ability to iterate through failure to find a product that people want. We have the technical chops and enterprise sales experience to move extremely quickly. From the time we pitched the first version of Naytev, to the time it was ready to be used by the first client was two and a half weeks for us to have a functional prototype up for one person to test. Basically we move fast. We are four founders, and most of us have known each other and worked together for years. Zack and Edward worked in Sales for both Google and Living Social which has been a large part of how we’ve grown to 150 sites so quickly. Zack also taught himself frontend development and has built all the user facing elements that you see at Naytev. Patrick is our data nerd analyst. He used to work in the solar industry using massive amounts to form prediction models on where solar is likely to spread. Very naturally he is using those skills to build our predictive algorithms and figure out how data informs social sharing. Mike is our CTO who came from NPR and before that Booz Allen Hamilton. He’s a full stack engineer and a distinguished Scala guy. He is actually one of the moderators for the Scala community on Reddit, so kind of a badass. 10% of online content drives 90% of engagement. Naytev builds software to help brands optimize social media as a distribution channel and always push the content with the best ROI. With Naytev, brands understand which form of content presentation will drive the most engagement, we then automatically push the highest performing posts. Can you give us a use-case? Facebook users spend an average of 45 minutes per day scrolling their news feed. Hundreds, thousands of times per day this user is thinking, “should I read this article? Or should I continue scrolling?” No matter how quality the content, companies only have a single thumbnail and headline to actually get someone to click. Large media publishers like TechCrunch or Seventeen are good examples. Before Naytev these sites would just publish one headline and picture for every one of several hundred daily articles. They wouldn’t know if a headline was performing well until after the news cycle ended when it was too late. With Naytev publishers can test ten headlines simultaneously and surface the best performing version automatically. When you post something on Facebook, the site reads embedded metadata to surface a thumbnail image and headline. Naytev hijacks that metadata and empowers our users to customize a couple different versions of that message. We then use data-science to actually infer which one is best based on real-time performance data. The system randomly surfaces the variety of messages until we have enough data to say, “This one works best. Let’s use it the majority of the time.” Optimization technology is commonplace in the ad world. We’ve added a complex data science layer to effectively read the best performing messaging for organic content in real-time. No one is doing exactly what we are doing, but there are clearly a number of startups that play in our ecosystem. There are a number of players in the native ad space which has been growing pretty loudly for the last couple of years. So if we choose to go down that route we will run into folks like Nativo and True X. In the social world, there are a few established players. Buffer and HootSuite both have large sets of clients who rely on them for what they currently think of as their social strategy which is really just providing tools to share content with their audience, none of the optimization that we do. On the testing side of things, you've got people like Optimizely who can help you test your messaging for visitors once they hit your site, and then Simple Reach who can help you buy traffic into your site that you can do with what you please. There's kind of this Battleship array of people in adjacent spaces but no one in really quite the same space as we are in. We have two products now. I’ll start with how the company started and then how we came to launch the second product. Naytev was hatched in early 2014 with the idea that we could help publications get more clicks on social media. We spent the first half of 2014 and all of our time at Y Combinator building a proof of concept and then proving it really worked for enterprise publications. The initial iteration helped our customers get more than 10 million unique visits. Publishers loved the product and signed up in droves - early customers were TechCrunch and Refinery29. Shortly after we launched to publishers in late 2014, brands approached us to optimize their own content. However, brand marketing requires a different strategy than publishers. So after Naytev was selling well we turned our focus to brands. Spark for brands was rolled out in early October. We compiled everything we knew about social media optimization for publishers and refined it for brands. Instead of using brand’s organic traffic as a data point to test messaging, we actually source additional traffic to refine the message before we promote it. If you’re someone like Wefunder, and you want to test your messaging, but don’t have enough users for an accurate dataset, we’ll create a lookalike audience using Facebook’s deep wealth of data to find people who resemble the audience you care about reaching. Spark let’s brands test everything they publish before they actually publish it. Companies never waste a dollar on messaging that doesn’t perform. Why has this become so important for brands and publishers to get right? The answer really comes down to the overlap of two big trends. On one side, ‘traditional’ online ads are failing - if you’re between the ages of 15 and 65, you’ve never clicked an ad on purpose. Nobody really discovers new products with ads anymore. This fall out of ads is overlapping with the second trend: consumers are discovering more and more via social media and quality content. As traditional methods fail social becomes increasingly competitive and brands are anxious to stand out amongst the noise. Being noticed for a few seconds each day is a win for many companies. The only way to consistently surface messaging that consumers notice is with quality data science and real-time optimization. Naytev gives brands and publishers the ability to consistently stand out above the noise. By the numbers, how important is social? What we’ve seen over the past couple years is not the expansion of social media in general, but really the ascent of Facebook. 31% of all web traffic begins with social media and Facebook accounts for ~85% of that (or 25% of all internet traffic). Pinterest is a very far second. How do your customers choose between Naytev or your competitors? Our biggest competition comes from the opportunity cost of what you could be doing instead of investing in social. Old school businesses still have myriad ways to reach their customers: billboards, commercials, direct mail. Often they’re weighing social as just a small part of their media mix. If you’re an old school business, and you’re thinking about, “How do I reach my customers?” You’ve still got myriad options. There are billboards, there is video, there is direct mail, and people are weighing us as part of their full media mix. There are a handful of players in the social media ad space - but they’re all collaborative with what we do. Companies need a variety of products to build a really thorough social media strategy and we’re just one important part of that stack. No one else is doing exactly what we’re doing for testing. We’re by far the best option to optimize your social messaging - we’re really fighting the battle to convince more companies that social media advertising is the best way to get their brand out there. What sort of lift in sales / readership can your customers expect? We measure success in two ways. The first is pretty simple: number of clicks. Typically we see a 10x improvement in average click through rate with Naytev. Our current record is we drove over one million extra clicks to a single article in one day. The second measure is more nuanced - the quality score of your brand in Facebook’s algorithm. The more frequently content gets a high engagement score on Facebook, the more likely that the subsequent posts will also score highly in the algorithm. As we improve average clicks across the board, we’re also giving you a bigger opportunity to reach a larger audience with each subsequent post. As content writers use Naytev they also learn what type of content works well - it’s a positive feedback loop on a number of levels. Our benefit isn’t just measured post by post. Naytev elevates the social presence of the entire brand and builds on that success. How do you help your clients produce quality tests and learn from the data? On both Spark and Native, the vast majority of tests are run by clients. We know that humans don’t scale anywhere near as well as computers, and in the majority of cases, most clients want to use their own writing staff, because they want their writers to get better at writing. That’s as true on the brand side as it is on the media side. When onboarding clients we’ll often have our writers create the first few campaigns to train the in-house team. We ensure they see the product works, then if a month later they aren’t seeing results we’ll come back in and do some more training. We have two members of the team who spend the majority of their time reviewing client experiments. Our best upsell opportunity is encouraging current customers to run more tests, and the best way to do this is bring in our creative team to provide completely fresh content. The most important thing we’ve learned over 18 months is that few things are generally applicable to all clients. We work with viral sites, we work with serious news sites, we work with brands, and there are no hard-and-fast rules for what works. What is most important is the presentation match the brand. We’ve gotten much better at context presentation, word count, picture choice, audience differences, etc. There are so many variables for optimum content presentation and we’re adding more all the time. The only way we’re successful is if our clients are successful - which means we do all we can to provide quality tests and help them learn from the data. Do you track cumulative engagement lift over time? Yes. This is really the best way to measure efficacy. On Naytev we measure, “boost,” or the raw number of additional clicks you got from using our software, that you wouldn’t have gotten if you hadn’t tested a better headline. In roughly half of tests, Naytev customers find a new headline that performed better than their original idea. Although the magnitude of that success varies from 1 new customer to 1 million additional clicks. Magnitude is inherently tied to how much traffic there was to amplify in the first place. How do you encourage writers (who don’t use social media marketing metrics) to use Naytev? This is super important. The more we get writers to engage, the more headlines are produced, the more testing is done, the better the results. So we recently built an API (that we actually use in-house) that gives every writer the ability to start testing directly from their content management system. We think by making testing super easy for writers, more of our clients will start to emulate the Buzzfeed culture of testing everything. Why was Buzzfeed so successful? How have they inspired Naytev? Buzzfeed is the model of well tested publishing - that may be the single reason they’re so successful. They know that packaging content for social media is almost more important than the content itself. Content without social virality and engagement is worth nothing for our clients. They’re excellent at understanding the density of sharing and the depth of engagement as a result. We’ve taken a few strategies right from Buzzfeed and packaged them for any company to implement. 1/ Shares per thousand page views - a metric that can’t be found on any other analytics platform. Then, 2/ we look at the average amount of engagement those shares get once out on the news feed. Those metrics in conjunction make for the best social engagement and we learned this from the best in the business: Buzzfeed. Is there more competition for ad optimization on the brand side. How does Spark stand out? Spark is different because our goal is different - amplify organic content. Most advertising optimization products only focus on ad clicks with no long lasting value to the brand or the marketing strategy. We just use ads as a proxy to simulate traffic and figure out the best organic content for any business. This way brands can actually learn what works, the content that gets read, the headlines that get clicks, the pictures that catch attention. With Spark brands figure out how to best blend organic content with paid promotion. Our competitors provide the short term solution - boosting today’s clicks. Spark is built to actually improve brand content over time so companies get better engagement with less money all while crafting a brand image that sticks. Ad tech is extremely saturated with companies trying to squeeze one more drop of blood from the stone. You can’t just buy customers and traffic like you used to. Companies are starting to realize that paying for slightly better versions of the same old ads won’t help them stand out. Spark is the first tool to really help brands create great content in a tactical, efficient way. Now companies can learn what sort of organic quality content drives traffic rather than just fleeting ads. Can you explain a Spark use-case? A brand will surface a couple dozen clients that actually purchased the product they’re about to push. Spark analyzes that subset and produces one or more ideal client personas. We then use Facebook to create an audience resembling that group of people and test the brand content with this audience rather than wasting ad spend on their existing fans. Brands don’t care most about engagement like publishers do. What they really care about is engagement from people that might actually buy even if it’s far fewer people. Naytev builds a smart test audience to test against before releasing content to the organic audience that matters most. Spark is much more a market research tool than an ad optimization tool. What does Facebook’s recent move into publishing mean for content and online traffic? Facebook and Snapchat have started to become more than just content aggregators - they’ve recently evolved into publishing platforms. Soon rather than just click through to The New York Times site, readers will read the front page on Facebook, within Facebook. Facebook wants to control the entire user experience from discovery through consumption. They just rolled out the beta to iPhone users a few weeks ago. Come spring, every content creator will have to publish directly on Facebook to stay relevant. Unfortunately, for most legacy media and for most brands, it’s going to take some catch up to actually get good at distribution on Facebook, and it happens to be the thing we’re best at. Facebook is making a really big play to just own more and more of the Internet and ensure users spend their time within their walled garden. The average user already spends 40+ minutes per day on Facebook. 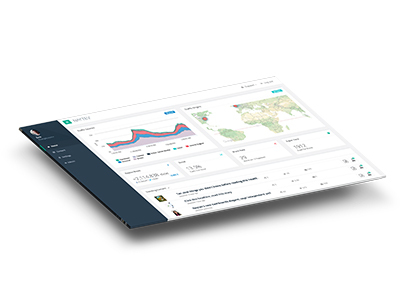 We’re excited to offer our clients a tool to generate the perfect content and headlines for the most important distribution channel that has ever existed. How much do you charge your customers? How many potential customers are there? Enterprise publishers are a key market for Naytev. There are approximately 10,000 enterprise level publishing platforms that care deeply about this type of optimization. Our average charge for a customer of this size is $3k - $4k per month, per site. The brand side market is even larger than the publisher market. There are over 1 million Facebook pages with over ten thousand fans. Any of those is an ideal customer for Spark. We make $100 a month off smaller companies, and closer to $3k per month from larger clients. Average revenue per user is $500 per month. A test takes 2-3 minutes to set up and run. We take care of the entire ad purchase process and serve everything to Facebook. A customer has an article, 3 photos, and 3 headlines. We generate nine test variations and within a few hours we’ll have significant click-through data on every possible combination. Then we’ll automatically serve the best performer to your entire audience. We buy leads in bulk. Anyone with a Facebook page is a good fit for Spark, so almost all of our mass marketing is aimed at getting people into Spark, and then cross-selling Native when it’s appropriate. Leads cost ~$0.30 apiece, and we buy them thousands of leads at a time. They’re all uploaded into an automated drip campaign encouraging them to try it out. Our acquisition cost is currently under $100 per user while our average clients return $150 in the first month. So we pay off customers in 2-3 weeks. Every month after that is gravy and our average lifetime customer value is over $2,500 (calculated by customer churn data). How many customers churn and why? Less than 10% churn. Most leave in the first few days because they just don’t have the bandwidth to run effective tests. It’s like going to the gym - everyone knows they should workout but just because you buy the membership doesn’t mean you’ll actually find the time. For really small companies it’s hard to pile on 100 tests a month to the VP of Marketing’s workload. Larger brands can delegate. For customers that actually give the product a shot - run more than a couple of tests in their first month - we actually have negative revenue churn because many upgrade their plans. How big can this get? Can you become a billion-dollar company? We become a billion-dollar company when we are the preferred option to serve all content on Facebook. There are only three ways for content to reach the News Feed. One: a regular person shares it to their own news feed. Two: a brand shares it to their brand’s Fanpage. Three, which is brand new: content creators publish directly to Facebook via API as Instant Articles. Our products cover those three channels and bring them into a single intelligent experience with effective levers to improve client engagement. Can we keep our head start and become the only platform by which publishers and brands feed their content to Facebook? That’s easily a billion dollar question. Fifteen years ago publishers started the transition away from print media to websites. We’re now at the crux of another paradigm shift - this time the industry is moving from the traditional website model to a model rooted 100% in social media. It’s no longer about search and find but rather discover and share. The company that understands this new distribution strategy and becomes the layer in between publishers and brands and Facebook will be big. We’ve averaged 30% month / month growth for the last six months. Up until May we didn’t charge for Naytev, and now our annual recurring revenue is about to cross $300k. 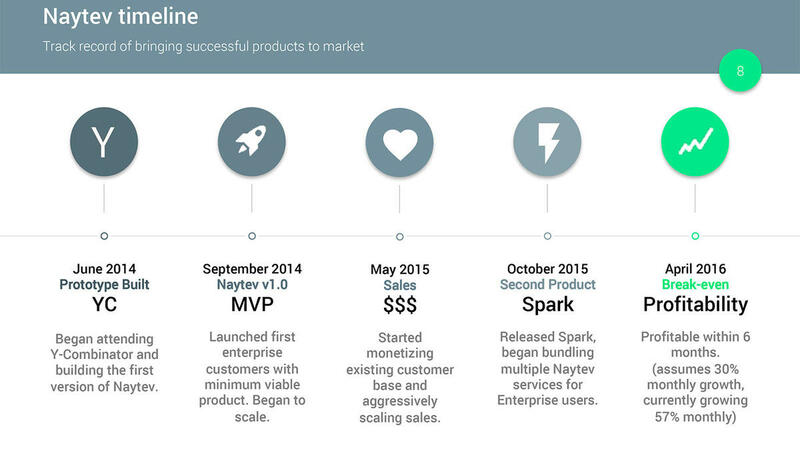 Revenue really started to turn up when we introduced Spark and perfected our acquisition channel over the summer. We expect to hit profitability in Q1 2016 at $85k monthly revenue. What’s your biggest risk? How are you solving for that? The natural, biggest elephant in the room is always platform dependency. If you’re building for Facebook, you are at the whim of that network. People ask us a lot, how do you think about building on top of a network that could change its mind and eliminate your business? 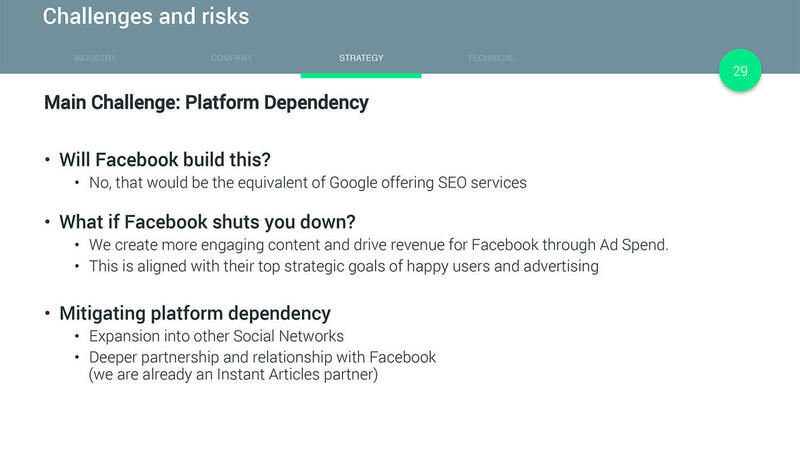 I think, if you’re going to build on top of an open ecosystem like Facebook, your goals should align with their core goals. The two things that Facebook cares most about are happy, engaged users, and revenue for Facebook. At Naytev, we drive both those things. Through testing, we teach people to create better content. And every time that we run a test Facebook makes money. We’re very much promoting the goals that they care about as an organization, and we’ve got a really strong relationship ongoing. It’s a risk - but I think we’re approaching it with the right strategy. How important is Facebook? What’s the real scale of Facebook as an acquisition channel? Most people don’t really understand how influential Facebook is - like really is. Ten million businesses spend on Facebook - far eclipsing what any other business has access to. Five years ago companies used Facebook to reach a few thousand users - now we’re building enterprise software to help brands with their most important acquisition channel. The majority of our publishers get a majority of their traffic from Facebook. Businesses worth tens or hundreds of millions of dollars rely on one channel for 70% of their business, that’s incredible. Will Facebook just build something like Naytev? It’s kind of unthinkable that the organization that filters organic rankings would also sell tools to help you better your organic rankings. It’s at odds with the way that good content is made. It’s not a moral issue for Facebook, but rather a practical business reason for Facebook as a network. We use networks because the content that they surface is relevant and good, and any network that allows advertisers and content creators to pay for better distribution directly will fail. Facebook won’t risk it, it’s at odds with the core of their business. 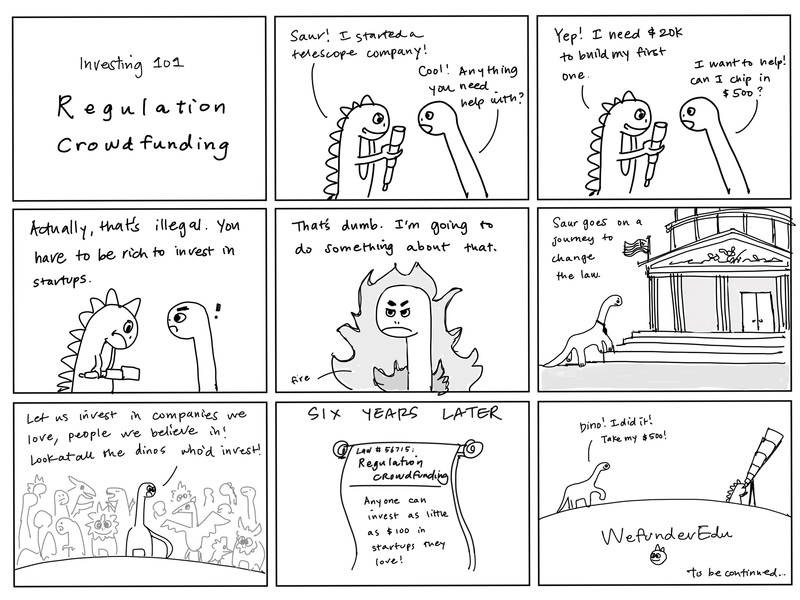 Naytev is conducting a Regulation D offering via Wefunder Advisors LLC. CRD Number: #167803. In fact, today, what is marketing and who makes marketing materials is more up for grabs than ever. In this accelerator batch, a set of companies suggest some new directions for digital marketing themed around content (marketing comes from providing consumers with interesting content they might actually enjoy). Like it our not, social media is a giant bucket of traffic just waiting to be poured on your site. But figuring out exactly which headline or image combination resonates best with your Facebook or Twitter followers is tough. Naytev claims it can cut through the guessing with real world A/B testing of social media posts. Sites using the service get real-time analytics from their posts and can adjust their social media strategy accordingly. Thanks for vouching for Zack! If you'd like to invest in Zack, please open an account. We'll waive your fees if you do it now. We asked Zack for 10 personal references. Can you vouch for Zack?